Following successful back-to-back performances of our concert Fallen, Camerata Nova has a quick turnaround with a free Santa Clause Parade Day Concert at the Manitoba Hydro Building (Nov 17), as well as A Concert in Benefit of Sistema Winnipeg (Nov 18). Read more below. 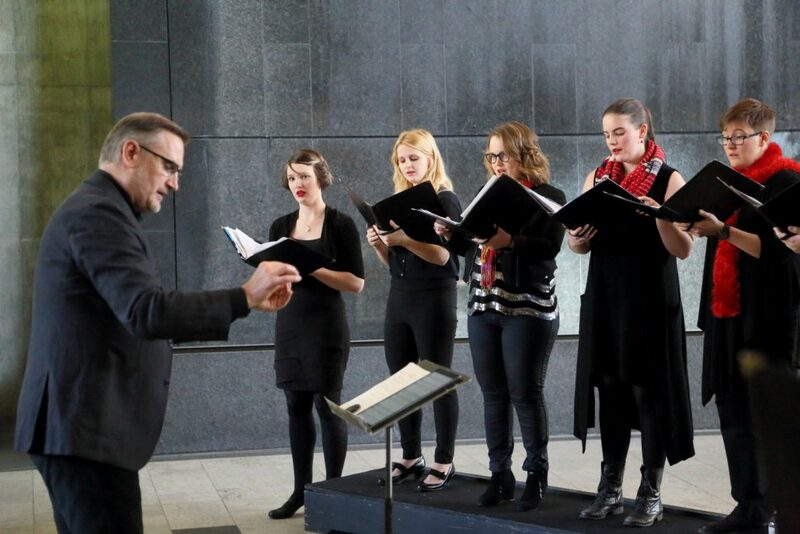 Saturday, November 17, 2018 at 2:30 pm in the Atrium of the Manitoba Hydro Building – A light holiday concert led by conductor Vic Pankratz to get you in the spirit before watching the Winnipeg Santa Claus Parade. Enjoy cookies and hot chocolate at this free concert in the Atrium of the Manitoba Hydro Building. Our free performance features Christmas classics, Camerata Nova originals, as well as some sing-alongs. Sunday, November 18, 2018 at 2:00 pm, at St. John’s College, University of Winnipeg – This concert in benefit of Sistema Winnipeg will feature the Sistema students in their first public performance of the 2018 – 2019 season. Sistema Winnipeg is an intensive after-school program that uses orchestral music to serve children with the fewest resources and the greatest need. The concert will also feature the innovative choral music of Camerata Nova. The event is hosted by Winnipeg Symphony Orchestra Resident Conductor, Julian Pellicano and held at the St. John’s College Chapel, University of Manitoba, 92 Dysart Road on Sunday November 18 at 2:00 pm. Tickets are $40 for adult and $15 for students and children. Help us to help this innovative inner-city music program. Reception and Silent Auction to follow the concert. For more info and to purchase tickets, please visit Sistema Winnipeg.